Sanilac Petroglyph drawings by Darrel J. Richards. Photograph by R. H. Hensleigh. In 1881, the “Great Thumb Fire” ravaged the woods of what is now Sanilac Petroglyph Historic State Park and its surrounding areas in eastern Michigan, causing 282 fatalities and burning upwards of one million acres of land. (Sidenote: The region received the inaugural relief efforts from Clara Barton’s American Red Cross, which was founded just months earlier). In the aftermath, a farmer surveying the damage to his land noticed large sections of carvings on a limestone outcrop that had previously been obscured by a thick brush which was now burned away. 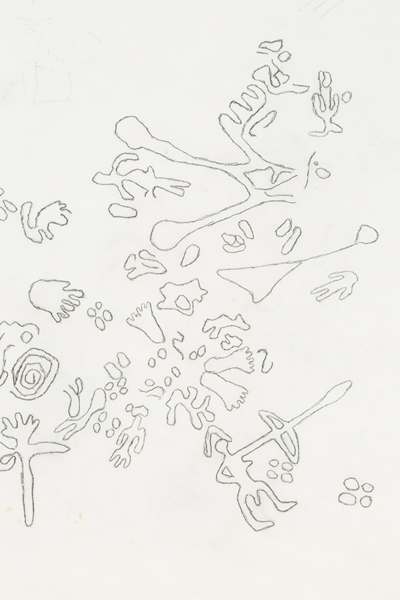 Sanilac Petroglyph drawings, detail. Photograph by R. H. Hensleigh. What he discovered were the Sanilac Petroglyphs, rock carvings almost certainly made by a member of the Anishinaabeg people between 300 and 1,000 years ago. As the only known prehistoric rock carvings in the entire state of Michigan, scholars took an ardent interest, and in 1940 two members of the Aboriginal Research Club of Detroit–Darrel J. Richards and Carl Holmquist–traveled to the site to create drawings and castings of the petroglyphs. 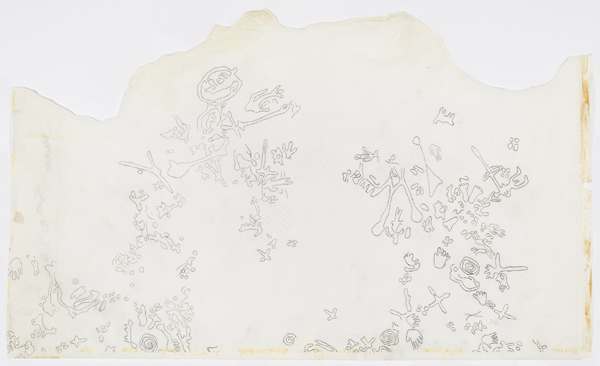 Richards’s drawings are now in the collection of the Cranbrook Institute of Science, and were most recently on view in Cranbrook Art Museum’s exhibition, My Brain Is in My Inkstand: Drawing as Thinking and Process. To learn more about Cranbrook’s relationship with the petroglyphs, check out Cranbrook head archivist Leslie Edwards’s blog post on our sister blog, the Cranbrook Kitchen Sink. 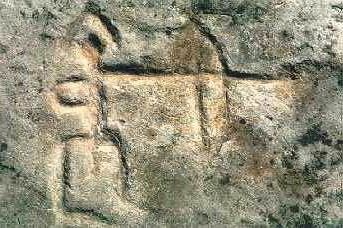 This images of one of the carvings shows a man with bow and arrow, identifiable in Richards’s drawing of the petroglyphs above. Photograph via Michigan Department of Natural Resources. At 7:00pm this Thursday, April 10, Cranbrook Institute of Science Anthropology Coordinator Cameron Wood, along with Stacy Tchorzynski and Dean Anderson, archeologists from the Michigan State Historic Preservation Office and the Department of Natural Resources, will examine the Sanilac Petroglyphs in a free lecture at CIS. Immediately following, 30 paid attendees will continue on to the Institute’s collection vault to examine the original Sanilac Petroglyphs drawings and plaster casts from the 1940s. Here is the Facebook event page, but you’ll need to book in advance: Tickets are $30 per person for Cranbrook Members and $35 for the General Public. To reserve your spot, please contact Kim Larsen at 248 645.3319, or by email at KLarsen@cranbrook.edu. The rock carvings at Sanilac Petroglyphs Historic State Park are officially open for view by the general public on May 28 and throughout the summer (more information here). Whether you’re planning a trip out to the Thumb or not, Thursday’s events offer an exciting opportunity to learn more about one of Michigan’s great historical treasures, and a provide rare, behind-the-scenes glimpse of Cranbrook Institute of Science’s impressive collection!